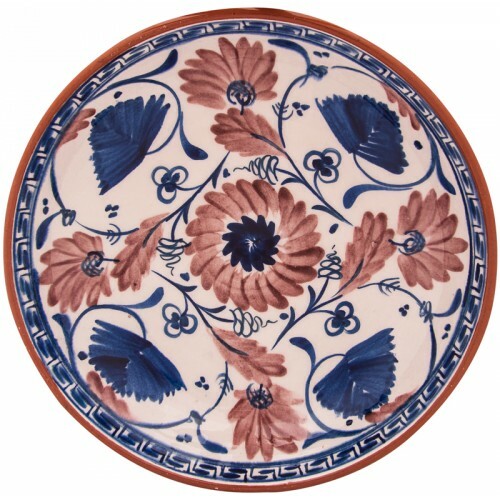 Miletus flowered Ceramic plate is hand made by Adil Can - Nursan Art Work Shop using miletus technique and it's unique and signed. They are the ceramic group decorated with black, blue, turquoise, green, purple or violet paint, undercoated with transparent or turquoise coat in Iznik and Kutahya during Beylik period in Anatolia in 14th and 15th century. These ceramics, after shaping red ceramist clay are undercoated with white clay and first cooking is performed. Following the first cooking called biscuit, decoration is performed and it is cooked for a second time under 900 degrees following undercoating with transparent glaze. Generally herbal and geometrical decorations predominate in Miletus ceramics. They contain original decorations that may be taken as examples for modern day designs. Dimensions: Height 5, diameter 25 cm. Adil Can-Nursan Art Work Shop is scientifically manufacturing traditional Anatolian ceramics both to transmit classical model to future generations and to bring Anatolian ceramics to light. Artists, interpreting characteristics and decorations of the era of every civilization meticulously and using the philosophy of the said era, complete all the phases from lathe to ovendrying in the workshop. 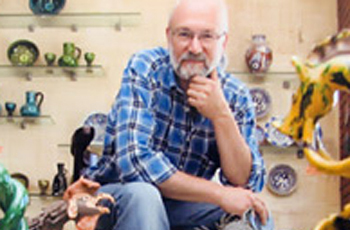 Adil Can Güven who was born in Inegöl in 1953, is the nephew of figurine artist and ceramist Abdurrahman Özer, a member of a family continuing the tradition of mentor-protege system. He started ceramics education in 1970, completed apprenticeship under great mentors in ceramic centers such as Kütahya, Çan, Çanakkale where he learned from this mentors. He started his academic carrier in 1995 in Iznik Vocational High School. In 1998 he moved his workshop from Inegöl to Iznik. And still with the support of his wife Mrs Nursan, they continue to produce all the Anatolian ceramics using traditional materials and equipments. For 25 years in the workshop they founded with Mrs Nursan, they prepare glazed basins manufactured since 5000 B.C, Greek ceramics with reduction (red and black figures), white clayed Roman relief ceramics, Byzantine and Seljuk sgrafitto (undercoat scraping technique) ceramics, slip (undercoat decoration technique) style ceramics, colored glazed black decorated Seljuk and Ottoman ceramics, blue white ceramics of Beyliks Period , Çanakkale ceramics, 18th century ceramics and with the raw material they gathered from Iznik 15-16-17th centuries Iznik ceramics. The couple, with various collective and personal exhibitions, also prepare their own designs with the same techniques and philosophy. Their products are considered to be work of art by Ministry of Culture.